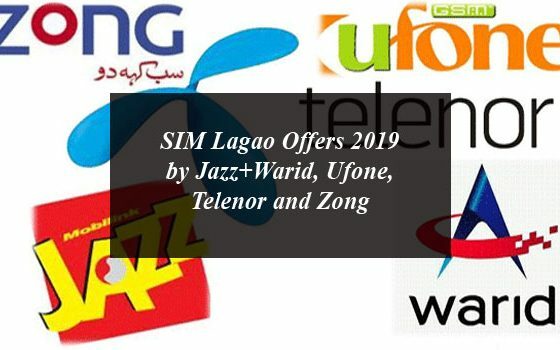 Today we will talk about the SIM Lagao offers 2019 by all the telecom operators in Pakistan including Jazz+Warid, Ufone, Telenor and Zong. The Jazz+Warid customers who have not used their SIMs since the last 30 days are eligible for SIM Lagao Offer. The customers can enjoy 50 Jazz+Warid minutes daily, 3000 SMS and 3000 MBs (except 9pm-1am) of internet for 60 Days under this offer. Customers can also get 50 Jazz+Warid minutes, 50 SMS & 50 MBs (2G and except 9pm-1am) of internet applicable for 1 day on the usage of Rs. 15 (inclusive of tax). How to avail Jazz+Warid SIM Lagao Offer? You can also dial Just dial *553*2# for checking the status of the offer. 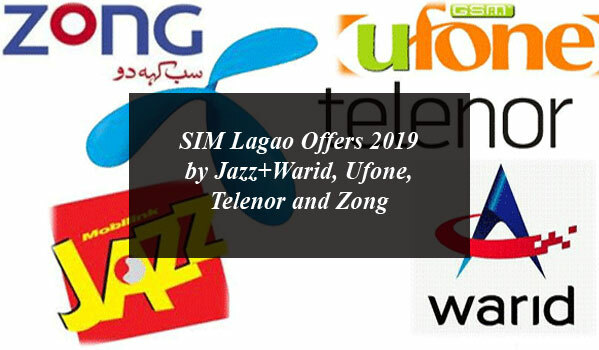 Jazz+Warid SIM Lagao Offer 2019 is only valid for those users who have not used their SIM since last 30 days. The Offer is subject to change anytime. All calls under the offer will be charged PKR 0.20. Ufone Sim Lagao Offer is for those Ufone customers who have not used their SIM since last 60 days. The customers of Ufone who have not done any activity on their sim can get the data bundle for the 30 days without any recharge. Under the Ufone SIM Lagao Offer the customers can get 3000 U to U and PTCL minutes, 3000 MB of internet and 3000 SMS to any network in Pakistan. You can get these incentives for the next 30 days after switching back your Ufone SIM. You can get the incentives on daily basis such as 100 free minutes, 100 SMS and 100 MBs free Internet daily for 30 days. How to activate Ufone SIM Lagao Offer? Ufone customers can avail this offer by dialing *5000#. The offer is for limited time. Customers will get free 100 minutes, SMS and MBs daily for the next 30 days that will be posted on daily basis. Customers can use free Mbs on Ufone 2G/3G network. Call setup charges of rupee 0.2 are applicable for each call. Telenor comes with the Sim Lagao Offer for its customers who have not used their SIM since 29th November, 2018. The customers of Telenor who have not done any activity on their sim can get the data bundle for the next two months without any recharge. Under the Telenor Sim Lagao Offer customers can avail 3,000 minutes and 3,000 MBs of internet for the next 60 days after subscribing for the offer. You can get the incentives on daily basis such as 50 Free minutes and 50 MB Free Internet daily for 60 days. How to Activate Telenor Sim Lagao Offer? Telenor customers can avail the Sim Lagao Offer after dialing IVR 2222 and also send free SMS on 2222. The offer is valid for those Telenor customers who have not used their Sims since 29th November, 2018. Bonus will be posted within 2 hours from the time of subscription. The users of Telenor Sims in Muzaffarabad, Mirpur, and Kotli are eligible for on net 3,000 Minutes only. They can not avail of free internet service. The customers who bought new sim are also eligible for the offer. Now Zong is bringing the SIM Lagao Offer for its customers who have not used their sim since last 30 day are eligible for the offer and can get 6000 minutes, 6000 SMS and 4000 mbs of internet for the next 60 days. How to Activate Zong Sim Lagao Offer? The Zong Sim Lagao Offer is only for prepaid users who have not done any activity since last 30 days on their sims. The customers of Zong 20, Zong 30 and Zong Economy are also eligible to subscribe this offer. Under the offer the Zong customers can get 100 free minutes, 100 sms daily for the next 60 days. Customers will get 2000 MBs on Day 1 and 2000 MBs on Day 31. Data incentive validity is 30 days and will not carry forward to next month. Customers can use the incentive offered by Zong after 4:00 AM daily. How To Block Extra SIM Cards Issued Against Your CNIC?